A six-day ethnic conference on Burma’s nationwide ceasefire process concluded in northern Shan State of Burma, or Myanmar, on May 5. The conference was to discuss a draft nationwide ceasefire agreement that the government of Myanmar and 16 armed ethnic groups signed on March 31, seeking to end decades of domestic conflict, just months before national elections are due. A consensus was apparently not reached, and some ethnic armed groups threatened to pull out of the agreement. Before the conference, The Diplomat spoke to U. Twan Saw, the Deputy Chief of the United Nationalities Federation Council, a large coalition of armed groups, at an undisclosed location in Southeast Asia. Mr. Twan Zaw spoke on what the signing of the draft means, how long the peace process might take, the role of the international community, and what to expect in the near future. 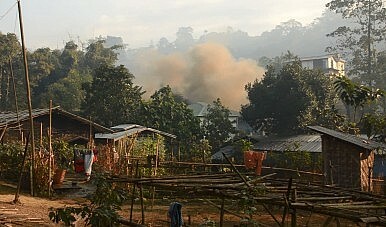 Jade smuggling is fueling ethnic conflict in resource-rich Kachin state.